Occasionally, you have an opportunity to buy a product that can make your life easier. When you want to buy a good bread machine, it makes sense to look for a bread machine review to get an unbiased opinion. Technology has made remarkable advances in kitchen appliances, giving you unimaginable options and performance. The Breville BBM800XL Custom bread maker has the same features as competing models and some that others do not have, but it raises them to a higher level. This top-rated bread machine has options that are fun to use. 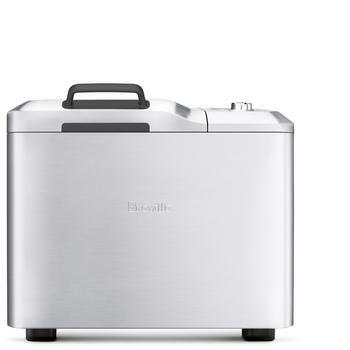 Is Breville BBM800XL the Ultimate Bread Machine? 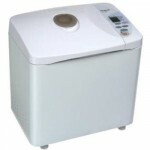 When searching for the best bread machine, you can find many that have multiple settings. While Breadman’s popoular TR875 has 11 pre-set settings to choose from, Breville BBM800XL has 13. The presence or absence of a fruit and nut dispenser is usually a focal point in a bread machine review. Some models have a dispenser that lets you add fruit and nuts to a recipe. While the cheaper alternatives like Breadman TR520 rings a bell to remind you when to do it, Breville BBM800XL custom loaf brad maker does it for you on auto-pilot. Its control panel lets you direct the course of your creation more specifically than others, and its price reflects its higher level of sophistication. 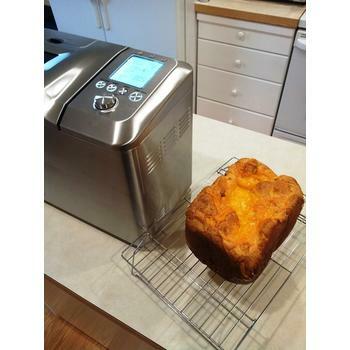 A bread maker review typically reflects the reasons that one machine costs more than others so that you can have the facts that help you make a decision. 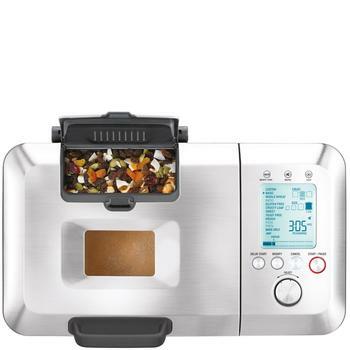 Priced at the higher end of budget spectrum, this model uses superior technology that provides automated features to enhance your bread making experience. 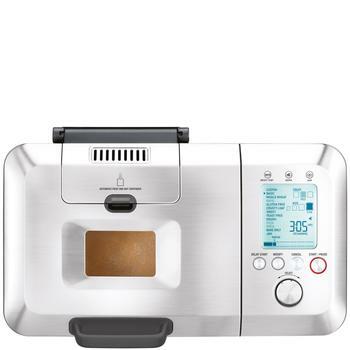 A display that is easy to read on the best bread maker has large fonts and back lighting so that you can monitor the process before, during and after baking. Clearly, this is something that the likes of lower cost Black & Decker B6000C lacks. Icons are easier to see than small letters, and the automated settings are handy if you are a beginner level baker. The machine can produce perfect loaves of basic or whole wheat bread as well as dough for your pizza and pasta creations. Its custom features let you customize your dough. This is especially enjoyable but only if you are an experienced baker. 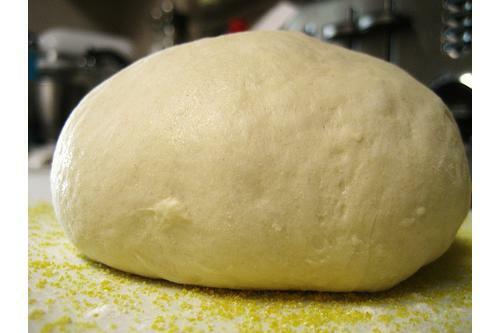 Customizing your dough lets you modify any phase of the bread making process. With settings that let you modify the temperature for the pre-heat and rise phases as well as for the bake cycle, you can create a loaf that suits you perfectly. If you’re a passionate baker (like myself), you know how fun it is to experiment with doughs. You jolly well know what a difference can a half-cup of water makes to the dough texture and eventually, the baking outcome. Some custom settings include knead one and two, rise one and two, punch down for each and rise three. As gluten free flour gains in popularity, the custom settings offer important options. Whole wheat flour responds differently from bleached flour, and some elevations affect the baking of bread. This is a point often discussed in many bread machine reviews. The machine can store as many as nine of your recipes, and the recipe booklet gives you more than 45 with step by step instructions. 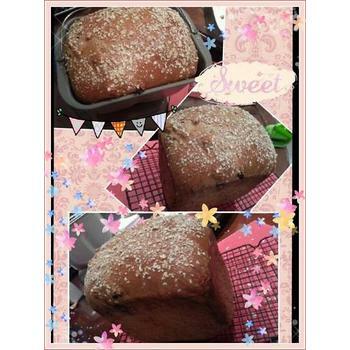 They show you how to make whole wheat or gluten free bread or one that is yeast free. A sweet loaf with a crusty top is inviting on a cool morning, and you can use your machine to make jams to put on top. The kneading paddle in the best bread machine does its job and then gets out of the way. You probably have no idea what this is all about unless you have previously used a bread maker. The kneading paddle design found in lower priced bread maker models often leave a lot to be desired. But not when you get a Breville BBM800XL. The paddle collapse effectively without leaving a large hole on the bottom of the loaf. This model minimizes the size of the hole so that the loaf suffers no ill effects. The size of the bread pan is well suited to a loaf that weighs two pounds or more, but smaller loaves emerge in a shape that is wider and shorter than you usually expect. To make them have a typical shape, you can shape them by hand prior to the start of the final kneading phase, and a few beeps from the machine lets you know when to do it. 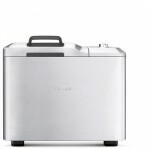 The metal case on the machine is sleek and beautiful, but it is thin and easy to dent. dented. You’ve just seen an in-depth coverage of the Breville BBM800XL Custom bread machine. While it is possible to go on and talk more about it, I think you have all the information that is important to make a well-informed decision. 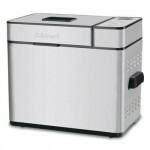 In short, this customizable bread maker is designed not to be an entry-level bread maker. It costs a few times more than the no-frill machines, but of course with good justification. But in the end, it is your final score that will decide if this is the best bread machine that you need. Though it’s received an average of close to the perfect 5-star rating, it doesn’t always mean it is the best investment for you. I’ve said my part. Now, it’s back to you to take on the most important part – to decide.